Unanimous City Planning approval followed behind the scenes deal between Mayor de Blasio and Two Trees Management. On March 5, 2014, the City Planning Commission unanimously voted to approve special permits and a zoning text amendment requested by Two Trees Management to transform the Domino Sugar Refinery into a 2,928,429 sq. ft. mixed-use development. The predominantly residential large scale development will include commercial and community facility uses. The City Planning vote followed an announcement by Mayor Bill de Blasio on March 3rd, stating that the City had reached an agreement with Two Trees to significantly increase the amount of affordable housing units in the development. Two Trees purchased the Domino site from Community Preservation Corporation (CPC Resources) in 2012 for $185 million after its failed attempts to transform the Williamsburg waterfront property. On January 22, 2014, Two Trees presented its version of the plan which differed from the CPC Resources plan that already won City Council approval in 2010. At the January 22nd public hearing, Jed Walentas of Two Trees promised only to build 660 units of affordable housing and noted that the previous developers had only committed to build the equivalent number of units of affordable housing in a non-binding memorandum of agreement. Vishaan Chakrabarti of SHoP Architects, stated that the Two Trees proposal stood in “stark contrast” with the CPC Resources approved project. Chakrabarti noted that there was a 40 percent increase in public space from the previous plan, as well as a plan to fully integrate affordable housing with market rate housing unlike the previous plan which sought to create a separate building dedicated to affordable housing. 421-a rules give tax incentives to new housing developments with three or more units, located on sites that were vacant, underutilized, or had a “nonconforming” zoning use, if 20-percent of the residential units in the development is allocated to affordable housing and mixed-in with market rate housing. Two Trees is seeking to exempt the waterfront section of the development property from 421-a, so that the developer may maximize waterfront profits by not including any affordable housing units in the waterfront section of the property. Walentas stated that the waterfront building will solely be used for commercial and community facility use. Walentas indicated that without 421-a, the commitment for 660 units of affordable housing would not be economically worthwhile for the developers. During the March 5th vote, City Planning Chairman Carl Weisbrod stated, “I believe we are all in agreement that this application represents an improvement over the previously approved Domino project with respect to its site plan, enhanced open space, and the fact that it will include incubator, tech and commercial office space that will enable emerging industries to grow in Williamsburg.” Noting that affordable housing was “one of the core issues throughout the review” of the Domino project, Chairman Weisbrod stated that the Commission wants to ensure that the public can share in the increased value of the Commission-approved application. 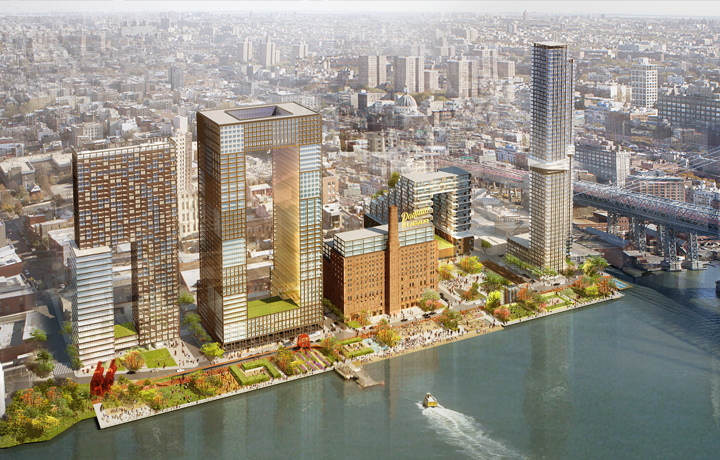 As it stands, City Council will review an application to develop the Domino Sugar Refinery into more than 2,200 units of housing with 700 units and 537,000 sq. ft. committed to affordable housing, approximately 480,000 sq. ft. of office space, 110,000 sq. ft. of retail space, 143,000 sq. ft. of community facility space, including a school, and a 4.8 acre publicly accessible open space along the waterfront. CPC: Domino Sugar Refinery (C 140131 ZRK–Zoning Text Amendment); (C 140132 ZSK–Special Permit); (C 140133 ZSK– Special Permit); (C 140134 ZSK–Special Permit); (C 140135 ZSK– Special Permit); (C 140133 ZSK– Special Permit)(March 5, 2014).